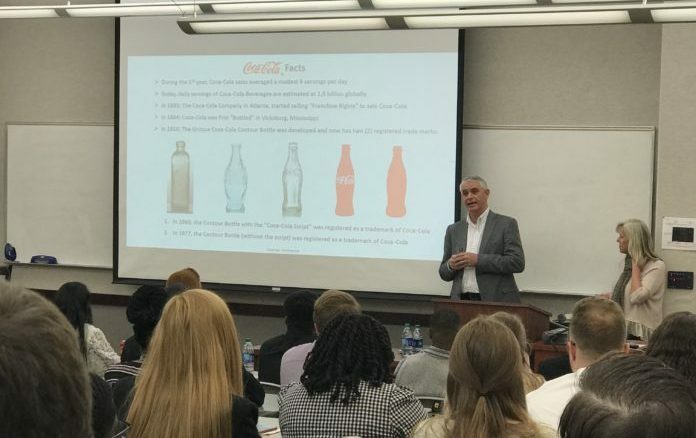 Representatives from Coca-Cola Company recently held a showcase with students of the Richards College of Business at the University of West Georgia. In the showcase, they described the characteristics they look for in potential future colleagues at the Fortune 500 company. The representatives from Coca-Cola leading the showcase were key account manager for the East region, Tommy Brown, and senior national sales executive for the Coca-Cola Company, Cassie Foery. Foery also serves as the senior marketing manager for college-channel marketing, making her presence at this event even more special. Foery, a 30-year veteran of the company, has done everything from selling fountain dispensers on the streets of Los Angeles to managing Coca-Cola relationships with big-name companies like the Walt Disney Company. Brown began his career with Coke in the late 70s and currently manages production and distribution of products across the southeast. Foery shared McIntyre’s sentiment about the event. She and the rest of Coca-Cola Company place a huge importance on finding and fostering young talent, which is why they make it a priority to meet with college students like those of UWG. Jonny Denny, a senior student studying business administration and marketing, expressed his gratitude that such a “large and prestigious” company would hold an event like the showcase, especially as he nears graduation. While UWG students surely benefitted from the information Coca-Cola came to share, the students were not the only ones learning at this event. Coke was able to gather new insights about how college students consume their branding by speaking face-to-face with students on campus. “As we look to the next generation of consumers, we want to figure out how best we can adapt to their needs and desires,” said Foery. Atlanta Coca-Cola Bottling Company, headquarters for the East Region of Coca-Cola UNITED, serves almost all of the state of Georgia within Coca-Cola UNITED’s footprint.